The colorful country of Jamaica is the third largest island in the Caribbean and one of the biggest when it comes to bold foods and flavors. Known best for its Jamaican Blue Mountain coffee, jerk chicken, and reggae (home to Bob Marley), the island is unique in their Caribbean-inspired food. Authentic Jamaican food was born out of necessity and is the epitome of local - whatever's fresh and locally available is what's on the Jamaican menu. Due in part to their island location, the cost of flying in non-local food can be prohibitive, so eating local and fresh is a necessity for much of the island. After all, it's island life, mon, and it's what makes Jamaica one of our favorite food cultures. If you're a fan of the ever-popular all-inclusive resort, you'll have no trouble at all finding the latest pop dishes. 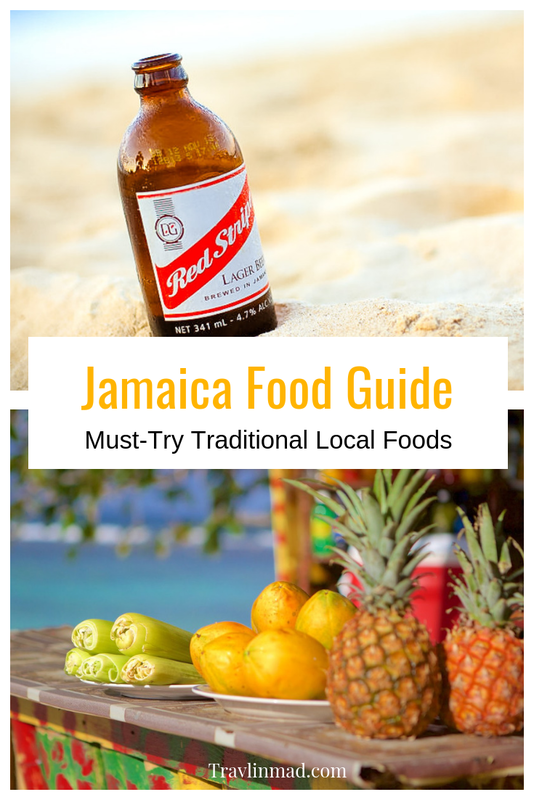 But if you're like us and prefer what's local and traditional - and you aren't afraid to eat from a roadside grill fashioned out of a 55-gallon metal drum - then this Jamaica food guide is for you. If you ask about what foods Jamaica is famous for, most people will surely say 'jerk chicken'. But the spectrum of Jamaica's food is much more colorful than many visitors realize. When it comes to food, Jamaica is irie! On our several visits to Jamaica we stayed away from the touristy areas of Montego Bay and Ocho Rios and headed for small towns where we could experience more of the local food and culture. We love Negril, taking side trips to Black River, Treasure Beach, and into the hills. And we prefer the neighborhood and boutique feel of the West End to staying in the luxe hotels on Seven Mile Beach. Jamaica has definitely grown over the years but it's still easy to stroll the side streets and pop into local joints to see what's being prepared that day. And Jamaicans love to share their food! The best thing about Jamaica's colorful food culture are the variations on the theme. If you've been to the island, all of these traditional foods listed here may look and taste slightly different than what you had. That's because everyone's version is different, and of course their version is the best. Which makes eating in Jamaica one of our favorite activities! Our list isn't exhaustive but is what we've personally experienced and enjoyed in Jamaica. Ackee and Salt Codfish is Jamaica's national dish, and an interesting and delicious dish at that. Ackee was brought to Jamaica in the 18th century, and grows on the island quite well, hanging in pod clusters from the tree. To be eaten it requires some timing because the fruit is poisonous if eaten too soon before it's ripe. The fruit in the pod resembles a small walnut (below left), and bursts open when it's ripe revealing a black seed inside (below right). Once open, the fruit surrounding the black seed is extracted and prepared, resembling scrambled eggs when its done. Ackee is usually eaten for breakfast, and it's very tasty! We had it several ways: first it was stewed with tomato, garlic, onions, bell pepper, spices, and of course, the salted fish - which is usually cod but sometimes mackerel. Ours also had some heat, so there was a scotch bonnet in there somewhere too. Another variation was simply like a scramble with just the ackee and fish. This version reminded me of some of the sardine dishes we had on our Venice lagoon island food tour. We thought the salted cod was similar in taste to Italian bacala codfish that's a traditional food in Italy. Served with rice, it's delicious. Ackee and codfish is also a popular filling for Jamaican patties, so if you see this, give it a try. So what goes on the plate with your jerk chicken? The ubiquitous rice and peas is found everywhere and with every portion of jerk chicken we've ever had. Readily available and easy to prepare, the rice is cooked with coconut milk and spices. But don't look for little green peas. In the West Indies and Jamaica most all types of beans are referred to as 'peas'. We've had this served with black beans but it mostly comes with the red kidney beans preferred by Jamaicans. When we first heard the word callaloo, we thought it was a slang phrase for something - what we weren't sure. We love sauteed greens and were pleasantly surprised when served this dark green and flavorful veggie. This is another food that is served with most meals as a side. It's green and leafy, and it's flavor reminded us of kale, spinach, or the ever-present collard greens of the American south. Callaloo is typically chopped and sauteed with onions, garlic and often scotch bonnets. It's nutritious, tender, and eaten with any meal, even breakfast. Here's a yummy thick and starchy vegetable that's often sliced, fried and eaten for breakfast in bread-like cakes, but can be had at most anytime of day. Passed down from the flatbread eaten by Jamaica's original inhabitants the Arawaks, this dietary staple is made from grated cassava root that's dipped in coconut milk then fried until golden. You may have had a similar dish if you've been to coastal Belize or the southern Caribbean coast of Costa Rica, where the West Indies traditional flavors have planted roots, and similar dishes are made. Bammy is often served as a side dish along with callaloo and other dishes. We came across a street vendor that had sweetened his recipe a bit, which was very nice. I'd love to try these with some honey or jam. Coco bread is a flour and yeast bread with a little coconut milk and sometimes a little sugar added, that's found throughout Jamaica. Cut into squares and folded over once, the bread is typically used for sandwiches. We've had everything from fried snapper to beef patties stuffed into the fold - think of a small crusty bun or a type of dinner roll. It's Jamaica's version of sweet white bread and is a real filler-upper, so bring your appetite! We eat Jamaican patties on their own with our hands, and have recently seen people posting pics of their patty sandwiched in between Coco bread. That's just carb overload, and not really a traditional way of eating patties. As much as we like jerk chicken, the Jamaican curry goat we had was even more tasty. This is a stick to your ribs stew that combines garlic, onions, ginger, hot peppers, and lots of Jamaican curry, slow-cooked to blend all the spice flavors with the meat. If you've never tried goat before, the taste alone is similar to lamb, especially the lamb we had in Patagonia roasted on the spit, where the drippings baste the meat giving it tons of flavor and very little gaminess. But this goat is stewed, often with potatoes and carrots thrown in along with some fresh herbs. Most often it's served with peas and rice on the side. The aroma of it as its cooking is tantalizing. It's thick and rich, and just might become your new favorite Jamaican dish We hope you give it a try. Run-dun is a traditional Jamaican fish stew generally made with garlic (of course), onions, tomatoes, hot peppers, spices and large chunks of fish, mostly mackerel but sometimes cod or even smoked mackerel, all slow-cooked in coconut milk. The dish is traditionally served with dumplings and boiled green bananas and is eaten for any meal. The dish gets its name because it's slow-cooked until it has a thick creamy consistency and the fish is falling apart or 'run down'. Given the oily fish that's typicallly used, the flavor is milder than you might think, but even so, you'd better like the taste of fish. The term 'escovich' generally refers to its preparation, so the ultimate flavor of the dish can be quite different depending on the ingredients. But first you need a whole fish - snapper works great but we've also had it with other fish. (We once had a parrotfish, fried beyond recognition, or we wouldn't have accepted it) so be sure and ask what kind of fish you're getting. The fish is pan-fried until crisp then drenched in the escovitch - a vinegar base with spices along with the vegetables that have been pickled in the vinegar (sweet peppers, carrots, onions, garlic, and the ever present scotch bonnet for a little zest). Some places will refrigerate the fish overnight after covering it with the sauce. It's then served chilled much like a ceviche. We've only had it served hot straight from the frying pan. Whichever way you have it, it will usually be served with bammy or fried plantains. Don't forget to order a cold Red Stripe to go with it - perfect with this dish. This might seem more like a sweet treat than a dessert but it's so popular for dessert in Jamaica you've gotta try it. These are simply prepared: fresh coconut meat is cut into small chunks then boiled with brown sugar and spices of the chef's choice. While still hot they are 'dropped' together and made into small cakes. Sweet and yummy! If you love sticky sweet desserts, Jamaica sweet potato pudding might be your new favorite, though it's not the kind of pudding you might think. Finely grated sweet potatoes are combined with coconut, vanilla, brown sugar, cinnamon and other spices, and often raisins and a little rum. The mixture is then baked until set. Jamaicans prefer it softer on top and firmer on the bottom. That's how we've always had it and it's one of the best dishes to eat in Jamaica. Like a slice of all things Jamaica on a plate! Jamaicans love their sweet desserts and this is no different. Sometimes seen as Grizzada, the origins of this dessert are believed to be Portuguese. Gizzadas are small round tarts, whose pie crust is stylistically pinched around the edges giving it the common name of a 'pinch-me-round', that's filled with grated coconut mixed with sugar, nutmeg, sometimes ginger, and vanilla. Crunchy on the outside and soft and gooey on the inside - try one of these. Your sweet tooth will thank you. Some of the world's most recognizable liquors and cocktails hail from Jamaica, and you may be even more surprised to find some new things in Jamaica that aren't yet exported. Jamaica is synonymous with the spirit of pirates, and there's no shortage of excellent rum here. From exquisite special editions to overproof rum, Jamaica produces some of the finest in the world. Appleton Estates has been distilling rum since 1749 and offers rums at just about every price point. J. Wray & Nephew White Overproof is a potent favorite of Jamaicans. It's cheap, goes down easy, and kicks you hard. Finally, Myer's Rum is a product of Jamaica, derived from molasses and is the favorite of Planters' Punch lovers. It's dark and leathery, and not too sweet. We discovered rum cream on our first trip to Jamaica and it was love at first sip! Sangster's is arguably the most popular rum cream on the island, and with us. It's produced by J. Wray & Nephew in several flavors but without question the original is still the best. Sadly, it's not available in the US but it is in Canada, go figure. Be sure to leave room in your luggage to bring some home! Expensive? Yes. Delicious? Absolutely. Jamaica Blue Mountain coffee is one of the finest coffees in the world. Blue Mountain is expensive not just because it's excellent, but also because there's just not a lot of room in the mountains to cultivate a large crop. Known for its mild flavor without being bitter, it's cheaper to buy it here. Something else you'll need to leave room for in your luggage, but well worth leaving some clothes behind! Even if soft drinks aren't your thing, try a Ting! It's everyone's favorite carbonated grapefruit soda in Jamaica. Similar to Wink, which is bottled in North America, it has a tartness but is still sweet - and reminded me of Quinine water. Ting is definitely robust and a fun local refreshment. It's true, you can easily get Tia Maria outside Jamaica, but we couldn't write a Jamaica food guide without mentioning one of their tastiest products now could we? And yes, Tia Maria is made right here in Jamaica, by expertly blending Blue Mountain coffee beans, Jamaican rum, Madagascar vanilla, and sugar. This sweet liqueur is a favorite of coffee cocktail lovers. It's sometimes blended with milk over ice, or as we prefer, poured straight over ice as an after dinner drink. If you love the taste of coffee and banana, order a local drink known as a Dirty Banana. Just be prepared when the bartender asks you how dirty do you want it? My advice? Get the floater - you're on island time! Add all ingredients to your blender, and blend with some ice until smooth. Cheers! We have traveled to Jamaica several times in recent years and fell in love with the country, its people, and of course the food from our first visit. But it still surprises us when we hear travelers express fears about traveling to this beautiful country. Our travel to Jamaica has never been anything other than genuinely warm and welcoming. But like any country that’s unfamiliar to you, travelers bear responsibility for learning a bit about the country beforehand and taking the necessary precautions that you would take no matter where in the world you travel. They must also take responsibility for their actions especially when it comes to drinking, doing recreational drugs, and hanging out with strangers. We’ve been offered drugs all over Jamaica by street and beach hawkers — Tourists Gone Wild on holiday are easy targets! So traveling smart should always go without saying. Read more on safety when traveling to Jamaica. Follow basic common sense precautions, and you’ll experience the beautiful country that Jamaica is — friendly, warm, and with some of the most amazing food you’ll ever have! Have we missed anything? What are your favorite foods in Jamaica?